It’s around 7am and the alarm goes off. Its Sunday the 16th September, Marathon day. The previous night was spent frantically searching for somewhere that sold pasta for my breakfast. Weird I know but out of everything I’ve eat/tried pasta seems the best thing for me plus it served me well through my training and I didn’t want to change anything for the big day. Linda had noticed the marathon breakfast option earlier in the day at our hotel and decided that she wanted to go for this, so after a quick shower and change into our running kit we headed down. A menu of porridge, energy balls, croissants and a different variety of items were available. Lo and behold pasta was on the menu…typical. I had a cup of tea (very British I know). The journey to the start was about 25 mins walk, we ambled along the streets which were now beginning to be fill up with marathoners all kitted out in club or national colours. It was a great sight and everyone seemed to be in a buoyant mood. We entered the designated area and both decided we needed the toilet, the queues were horrendous and after 15 mins of waiting we hardly moved a bit. Linda decided perhaps a better option was to go to the starting pen, it may be a little less busy and maybe there were more toilets so of we went. There are many advantages of being a bloke but one of the greatest has to be the ability to be able to go to the toilet literally anywhere. Whilst walking along I noticed a number of giant bin convenient doubled as toilets, 2 mins later I was sorted. Apparently, some ladies have the ability to pee anywhere too, I obviously hadn’t noticed that the giant bins were gender neutral, note Linda had slightly more class and decided against this option so off we went to the starting pen. Walking to the pen someone noticed my wave number and tried to direct me to a different starting pen, however, from the moment we discussed entering the Berlin ballot I always said that I’d run it with Linda, besides I was genuinely ready to quit marathons after New York as at this point I had fulfilled a dream. We got into our pen around 90 mins before the marathon, the toilet situation was no better. Huge queues and not enough toilets however as luck would have it we were next to a massive park trees a plenty. A lot of people took this opportunity to embrace nature, Linda was a lady and got into the queue, well, that’s the story I’m maintaining. Numerous toilet breaks later and the waves were beginning to get set off, we were in the last wave that was to be set off at 10am, the first was at 9.15am. The elite athletes were announced to the crowds, Eliud Kipchoge was in this wave and unbeknown to us this name would become more poignant at the end of the marathon. At the beginning of each wave the announcing did something different to try and incorporate the mass of runners and to get us all ‘excited’ about the impending 26.2 miles we were about to take on. The most memorable of these was a rendition of the thunder clap for a number of Icelandic runners that had turned up, for our own was a mixture of dance/techno tunes that he had us dancing to, it was probably the best start of any run I’d been party to. It was now 9:59:30 and so begun the 30 second countdown and then the gun, we were off. Like most marathons the start is a lot of jostling around, people running at different paces and trying to get into their stride, it takes the best part of 3 miles for everyone to get into their ‘positions’. The first 3-4 miles we ran through the city, going through Tiergarten, past the Grobe Stern (Great star) past Charlottenberg palace turning back around and heading towards the Reichstag this and the end of the marathon were the most picturesque. Linda set the pace, I’m sure she’d agree that she had not done as much training as me, and talking beforehand she was a little nervous about the marathon if not extremely excited. I didn’t want to take the lead as I didn’t want to go at a pace that she would feel uncomfortable so I dropped back a little and let her dictate the pace. I was surprised if not a little happy that we were running around the 9-9.30min mile pace, wow I thought perhaps we can make under 4 hours, something which would have been the ultimate aim. 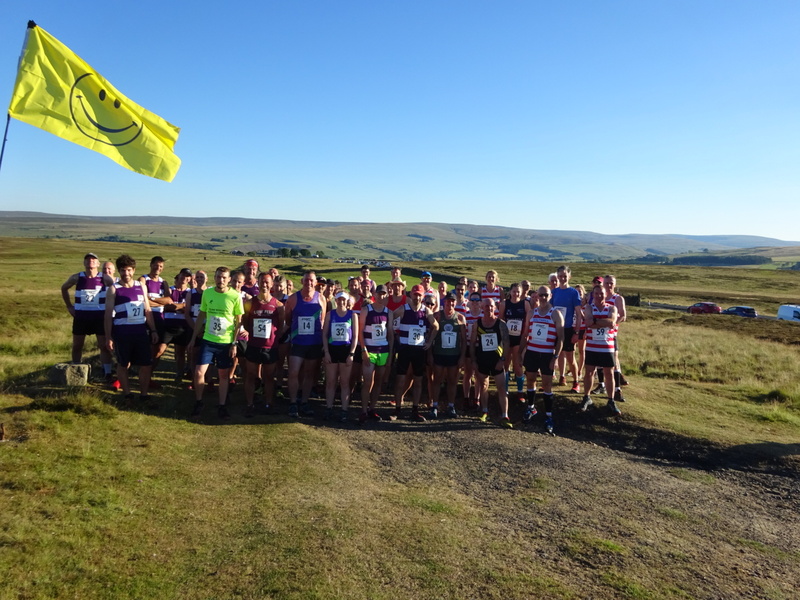 At around the 5 mile point we heard the shout ‘hooooops, come on Saltwell’, its always great to hear Saltwell support especially in a foreign country. Albeit I recognised the face I couldn’t put a name to it, I subsequently learned it was Jo Whitehead. Its always gives you a lift when you see a fellow hoop and the support of her and her family did not go unnoticed and was very much appreciated. On our way we passed what was referred to as the Star Wars building aptly names as it had Star Wars graffitied on in 20 foot letters or so I mistakenly thought. The graffiti did actually say Stop Wars on a closer inspection, in my defence I was in the Berlin TV tower earlier in the week and many hundreds of feet away when I made this error. Next came a particularly angry moment from me. Annoyingly despite having thousands of runners on a two lane road, idiot spectators still feel the need to want to get to the other side, I had noticed a number of people in front trying to do this however because it didn’t affect me I let it slide. Unfortunately one particular sole decided the most opportune time to run over the road with his bike would be right when myself and Linda passed. He probably didn’t expect a well-timed push and a number of obscenities flying his way, I was met with a stern, ‘calm down Darren’ from Linda. I tried to explain if either of us reared up due to them then we may have injured ourselves, I think it fell on death ears and so we continued. At different spots along the race were massage tables, you could literally stop in the middle of the race and get a leg massage as tempting as it was we continued. 18 miles approached, we had maintained our earlier pace until this point, around 4 hours we still in our sight and then Linda turn to me, ‘my Legs hurt’. Oh no, I thought. I tried to persuade her to continue by saying, ‘they’re not going to get any better if we stop’ this worked for about another mile. She turned to me again, ‘can we please stop, my legs feel like lead’. I wanted to continue as I had felt good but as I mentioned previously I always said that I would run Linda’s first marathon with her and I wasn’t about to change my opinion now. We took a minute or so walking break and continued on. The next 5 or 6 miles were a mixture of running and walking, the heat was starting to raise and it was getting close to 24c the run was beginning to take its toll. Earlier in the day we had seen that just down from our hotel was the 39km mark, we were soon approaching this only a two and a bit more kilometres to go, we were nearly there. On approaching the finish the crowds grew, people were cheering you on left right and centre. The best part of the whole marathon, for me, was next, we approached the Brandenburg gates and ran underneath them, the subsequent 200m to the finish was a procession we had crossed the line in 4hr 27minutes 47 seconds, we had done it. I was extremely proud that Linda had become the newest member of the Saltwell marathoners club. Despite an imperfect training regime, where she had been injured for a month, she had managed to get under 4hrs 30mins, which she had secretly hoped for and I was extremely happy to be there to share the experience with her. 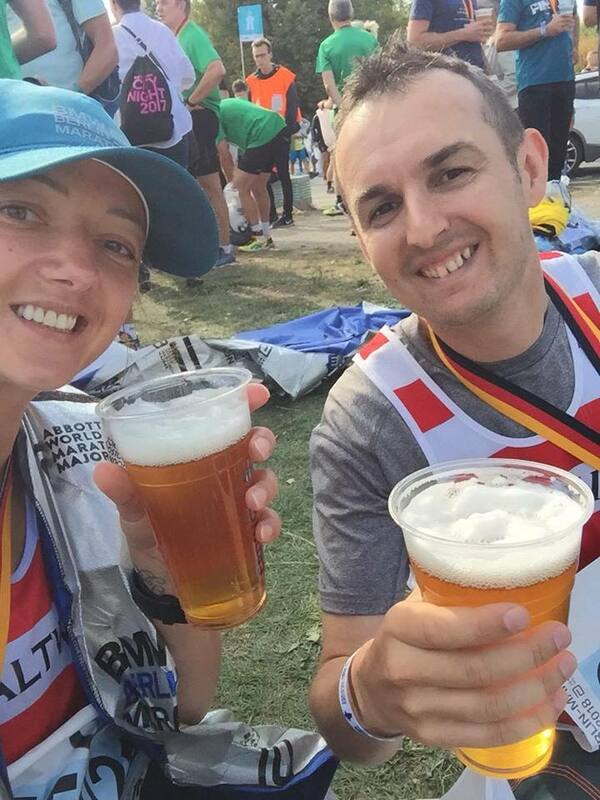 After collecting our medals we were grateful for a beer and to sit down and discuss our latest acheivement. I asked how Linda enjoyed it, she responded that it was difficult but extremely satisfying. Would you do another I asked, without hesitation there was a resnding, yes, I’m going to do them all! This is the point where I should add that earlier in the week when we went to pick our numbers up we seen a list of all the 6 star winners i.e. those that had done the big 6 marathons (London, NYC, Berlin, Tokyo, Chicago and Boston). Linda had noticed that no Latvian had yet completed this acheivement and wanted to be the first, what an acheivement that would be, so here’s hoping she can be the first. It was around this time that we heard about Kipchoge’s acheivement a Marathon world record of 2hr 1minute and 38seconds. It had worked out as an average of a mile every 4m38s or every 100m was ran in 17 seconds, extrodinary. It then dawned on us that we had taken part in the same race a world record was set. Wow, how many people cost boast that (apart from the other 34,000 or so who ran the race). What next you ask!? Previously I mentioned that following NYC I had no intention of running a marathon, following my decision to help Linda train and run her first, and being that we got into Berlin, I decided early on in my training that my goal is to be the first Saltwellian to acheive the six star medal, for those of you who do not know I now have 3 of the 6 stars. If my words or actions can encourage anyone to run a marathion, get out of their comfort zone and go for something they never believed posible then what I would say is, I may not be the best runner you’ve met, I may not have thre greatest physique of the runners you’ve met or the best running style of any runner you’ve met but what I lack in these area’s, I have determination in abundance and a never quit attitude, now more so than ever. When I started running 7 years or so ago I never evisoned myself running 1 marathon, I didn’t believe I was capable but as we speak I’ve ran 5 with another 3 to come. These things are doable, as I’ve proved you just need a bit of determinationand and now for me its not a case of if I’ll get the 6 star medal but when! You may have seen my photo after the marathon holding up my 3 fingers, now you know why. What you may not be aware of is that Saltwell’s very own Lee Wilkinson-Brown is also attempting the same feat (currently on 2 and has guranteed entry for his 3rd next year) as me, throw into the mix the newest Saltwell marathoner Linda and you now have the makings of a new Saltwell competion. So what next for me, well I’ve entered the Tokyo ballot and I’ll be entering Chicago ballot this year too. I’m more desperate to get into Chicago as I’ll be able to meet up with Lee next year which would be great but we’ll see. For Linda, she’s entered for ballott for the London Marathon. So stay tuned, there may be a few more marathon reports heading your way! But what we may have lacked in numbers we weren’t lacking in quality. The half way point sees you “punch” your number, the punches are positioned within in the river, this year you only just managed to get you feet wet! due to the dry summer we are enjoying.